Winter is here and with it comes blustery walks, 4pm sunsets and the essential log fires. 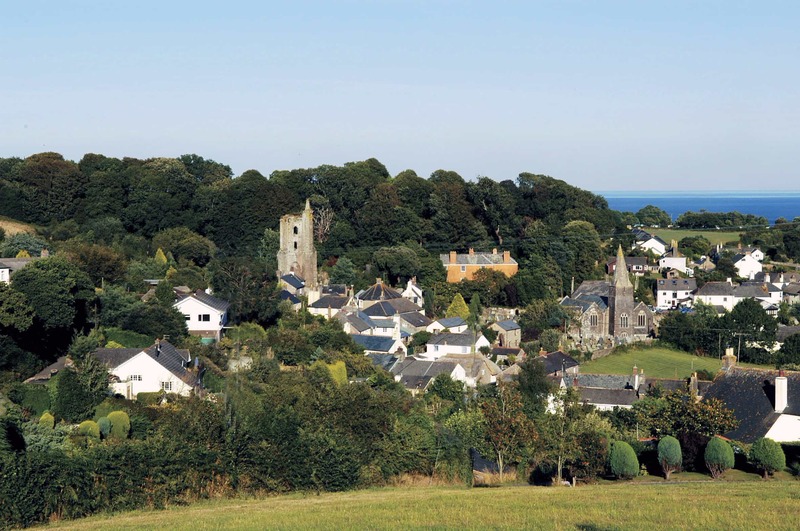 Exhilarating strolls along the coastal path and windswept trips to the beach invigorate, excite and restore, but there’s no better way to round up a day in the West Country’s great outdoors than bundling into a village pub and enjoying a few drinks and some festive spirit. South Devon’s most famous beach, Bantham, is a sight to behold come rain or shine. As the principle lure to this pretty, thatched village, the wide expanse of sandy beach offers picture perfect views to Burgh Island and immediate access to the coastal path. A conveyor belt of surfers and kite boarders dot the sea at all times, while dogs rampage the beach, chasing remnants of once luminous tennis balls. 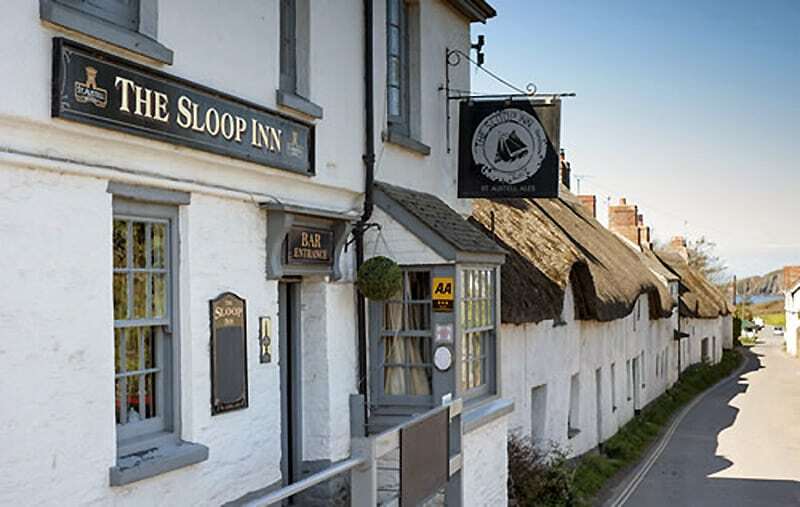 A few hundred metres from the beach, The Sloop Inn has been welcoming beach-swept visitors since the 14th century with locally sourced food and drink on tap. Once a haunt for pirates and a welcome sight for shipwreck survivors, these days the pub is more used to serving holidaymakers and water-sports enthusiasts. There’s a cosy bar with a toasty open-fire as well as an ever-so-slightly more formal restaurant that caters for bigger groups and families. Shortest stagger home: Beautiful Bantham House is a just a few metres from The Sloop and was voted the UK’s 9th Best Beach House. 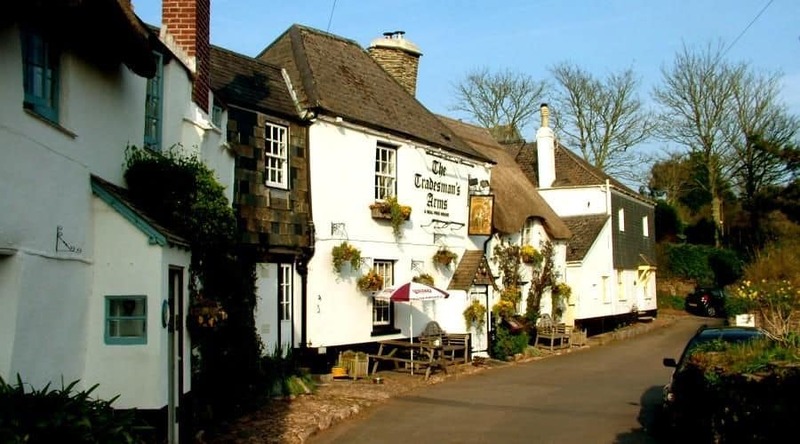 A country mile or so inland from the jaw-dropping Slapton Line, The Tradesman’s Arms also dates back to the 14th Century and is generally considered to be one of the prettiest pubs in the county. A traditional thatched inn, tucked away in a quiet corner of the village of Stokenham, The Tradesman’s has a romantic bar room with a warming wood-burner and a tasty seasonal menu. 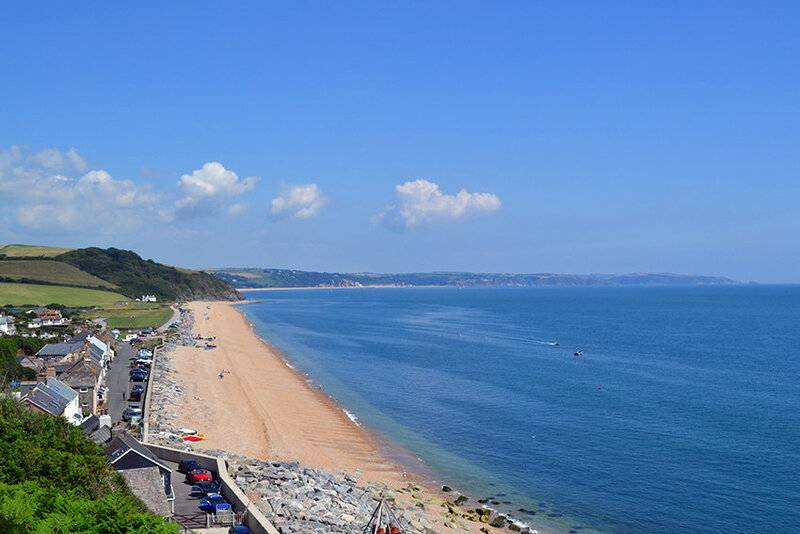 Nearby Torcross and the aforementioned Slapton Line are an ever-popular destination for beach walks and ocean-gazing, and are easily reached on foot from the pub. Here, the shingle beach stretches for miles with ocean on one side and a vast fresh water ley on the other. Shortest stagger home: A brief stumble away is St Kitts, a great 4 bedroom bungalow set in a quiet spot in the heart of the village. 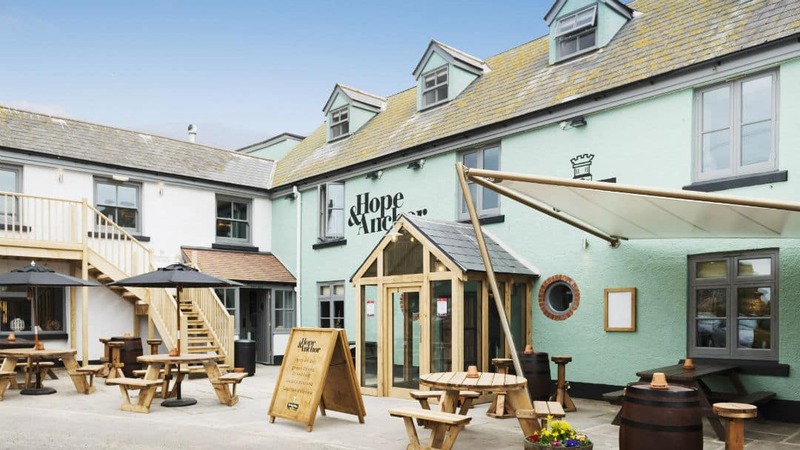 2015 saw the reopening of one of the region’s best known pubs, in the pretty coastal village of Hope Cove. A long standing favourite with our guests, Hope Cove is a beautiful old fishing village with two beaches, wonderful walks and a handful of places to eat, drink, buy an ice-cream or even a piece of art. Following its million pound makeover, one might expect that the long-standing Hope & Anchor had lost all of its character and charm, but we’ve not found that to be the case. 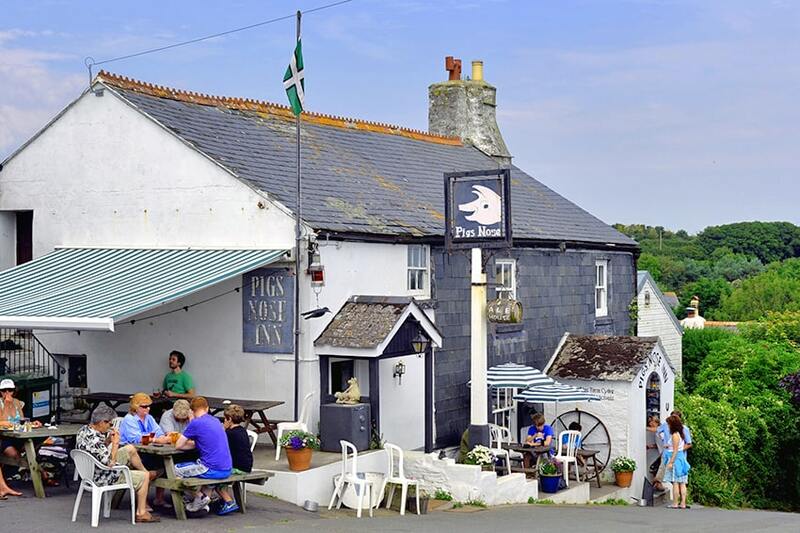 Encompassing magical views to Bigbury Bay, the pub still extends a warm welcome to locals and weary travellers alike, offering a brilliant menu, an excellent drinks selection and lots of lovely little touches to keep all the family happy. Shortest stagger home: You can walk to 4 bedroom, beachside Carmac Cottage in about the same amount of time it takes to pour a pint of Guiness; but we’ll forgive you if you make a pit stop at the excellent Cove Bar on the way. From one extreme to the other, there are few similarities between the Hope & Anchor and our next pub beyond the fact that you can wet your whistle in either. Dating back over 500 years, The Pig’s Nose was once a favourite haunt for smugglers who would stash their booty there, scavenged from stricken ships on the rugged coastline surrounding East Prawle. Today, the pub retains much of its old-fashioned charm and is an Aladdin’s cave of countryside paraphernalia and muso memorabilia (a nod to the present owners’ roots in the music industry). ‘Random’ is probably the word most commonly used to describe this gem and it’s certainly not for everyone; don’t be surprised to find your meal interrupted by a rousing speech from the landlord to commemorate somebody or other’s birthday, while campers from the nearby site trudge past your table to use the ‘in-pub showers’. It’s all part of the Pigs Nose unique charm. Good pub grub is available, great cask ales are on tap and the fire is lit throughout winter. Shortest stagger home: Line up the contents of a packet of dry roasted peanuts and you’d probably have enough to reach from the Pig’s Nose to Sunnyside, our beautiful 5 star detatched holiday cottage, just next door. Another staunch favourite among locals and our guests alike is this enchanting 14th century (when else?) Devonshire inn. Nestled in the pretty village of Slapton, The Tower packs the biggest gastronomical punch of our 6 with head chef, Dominique Prandi, having formerly worked with celebrite chef Jean Christophe Novelli. Making the most of the regions fine local ingredients and fresh seafood, the pub offers an excellent and ever-changing seasonal menu. At the other end of the Slapton Line to Torcross and Stokenham, Slapton is a short stroll away from the beach which shares it’s name. A circular walk takes in the inner banks of Slapton Ley and some of the surrounding countryside and is just right for working up a thirst or walking off a good feed. Shortest stagger home: Wonderful Barn Cottage, in Slapton, is so close to The Tower Inn that you’d be forgiven for popping home to use your own bathroom. The Cricket Inn sits on the seafront at Beesands. Sometimes it just boils down to location and few pubs in the region offer a more spectacular outlook than The Cricket Inn in Beesands. Just metres from the beach and the English Channel, the pub shelters behind the large breakwater that protects the building and its neighbours from the pounding waves that whip up during the winter storms. In the warmth and safety of the pub, there’s plenty of room for families to spread out with a large restaurant area and a spacious bar. The food is excellent, taking full advantage of the pubs positon on the seafront and the local fishing boats that make the short journey out into the bay to catch lobsters and scallops. Outside, the coastal path offers a breath-taking walk over the cliff tops to nearby Hallsands and beyond to Start Point. Shortest stagger home: You’re spoilt for choice in Beesands but pipping the rest by a handful of metres is a firm favourite of our guests, Kimberley Cottage, which sits conveniently just next door. For all these and more brilliant holiday cottages near great pubs, head over to our website.